Submitted by Sister Kathy Long, O.P. Going to North Dakota was a 15 hour journey by car from Waukegan. Peggy Ryan and I drove to Madison where we met Julie Schwab and three Dominicans from Adrian, Kathy Nolan, Marilyn Winter and Maureen Barzantni. Later in Bismarck we met with Evie Storto and Ceil Lavan, Dominican of Blauvelt. And the journey continues. For 9:00 p.m. evening prayer we began with ‘for our family at Standing Rock ‘ (prepared by Pace e Bene), “we pray for Our Sister Water who is our life. We pray for healing and safety of the Water Protectors . . .” In getting to know one another we shared why we answered the call to be there. We met the water protectors and were awed at their resilience and their spiritual journey in this struggle to stop the oil pipeline. It was an hour and 15 drive to the camp each morning from Mandan, ND where we stayed. Friday afternoon the 8 of us participated in direct action nonviolence training. We gathered with over 150 + folks from all over the US and Canada in a large white structure called a Mongolian Yurt. You might think of it as a large, tall circular tent. There was a light sprinkling of straw on the ground. Those few who carried chairs sat there, most were on the ground, all in large circles. Two women led the first part. 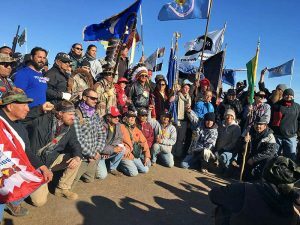 They represented various groups who gathered in solidarity, Black Lives Matter, Brown Berets, PICTO (People Improving Communities Through Organizing), American Indian Movement (AIM) Oceti Sakowin chapter. They empowered us to be conscious of our bodies and voices when we feel fear, and then anger. The body coils and tenses and lets out strong yelling. Our bodies use energy in unusual manners. When we are conscious of nonviolence and peace our bodies relax, feel warm and comfortable. Our training was to focus our energy for the action in the nonviolence and peace. The teaching was to focus on the mission and awareness of the power we have to make change. We stood and linked our arms together to show strength together. We stepped closer in the circles and found the strength in our arms linked together. The action for the next morning was to prepare us to be a shield of allies (white people) with arms linked together protecting the water protectors, our Indigenous sisters and brothers, in an inner circle in a prayer ritual. The strategy was perhaps the police would not so quickly attack the circle of allies shielding the inner circle of Native Americans. We were asked to move quickly and not delay getting out of our cars. Then a young native woman shared her multiple experiences of arrest as a testimony of police brutality and the possible things that may happen in an arrest and in jail. She stood and slowly turned around the circle telling of being pepper sprayed, handcuffed, thrown to the ground. She comes from Appalachia in solidarity. She mentions the crude realities that direct action may cost you. Those arrested are sent to jails across North Dakota, hours away. It is preferred to spend one night in jail before accepting a bond out as it will be less expensive. However the legal team will try to find you wherever they take you. It is important for each person to complete a jail form with name and address, contact friends. We were all a bit disturbed at hearing of the police brutality. In an effort to keep the next day’s nonviolent action covert, no details accept the city of Bismarck was given. The next morning over 500 people participated in this action. It was held at the site of the Dakota Access pipeline equipment storage in Mandan, next door to Bismarck. No one was arrested. We Dominicans dialogued on our options. We determined we would not participate in the direct action, nor go to the camp early to send them off. We sat together in contemplative prayer at 8:00 AM as we understood the caravan would be gathering and leaving. Then as we drove to the camp around 10 AM we saw cars coming over the hill, all lights on. The caravan was just now approaching heading to Mandan! We stopped our cars and jumped out to wave them on; it was a thrill to connect with them in this way. We thought we had missed them. What a blessing! God is good. Hours later in the afternoon the water protectors and all in the action gathered at the sacred fire. A large circle was formed of all who went for the action. All others were invited to go around to each person and thank him or her for doing this. 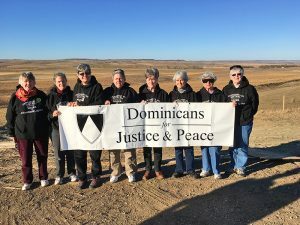 We Dominicans walked the circle with our sweatshirts, “Dominican sisters in solidarity Water and Standing Rock.” Many recognized us and thanked us for encouraging them and giving them a boost of energy as they drove to the action site. Our prayer and dialogue led us and guided us to be present as needed. A presence is a powerful witness and source of good energy. We did not ‘do’ much, but we were a Dominican presence in these tense times of preserving Earth and our Native people’s rights.